Pipeline inspectors for SandRidge Energy Inc. have traded in the notebooks, digital cameras and GPS receivers they once used to collect GIS field data and replaced them with smartphones running a location-enabled mobile application. Not only do the inspectors gather more data in a day with the mobile app, but the information they get is more detailed and accurate, as well. Based in Oklahoma City, SandRidge is the leading operator in the Mississippian Oil Play of northern Oklahoma and western Kansas. The oil and natural gas producer separates saltwater from hydrocarbons at the production wells and pumps the brine to disposal sites, usually between one and two miles away. SandRidge typically runs six-inch plastic pipes and eight- to 12-inch fiber-reinforced pipes from four to five producers to a single injection site. At any given time in 2013, the operator employed between 11 and 29 pipeline inspectors who are independent contractors. The inspector’s primary responsibility is to monitor the entire saltwater pipeline installation from start to finish and ensure the job is done safely and correctly. In addition, a company inspector is called to the scene of an excavation when a third-party is laying a pipe that crosses a SandRidge pipeline, referred to as a foreign line crossing. Installation of a standard 10,000-foot pipeline, buried to a depth of 48 inches, takes about 14 days. During that time, the inspector is required to collect photographic and descriptive information for four critical pipeline features: pipe-to-pipe joints, branches, valves, and foreign line crossings. Depending on the length and material, a single saltwater pipeline usually has five to ten of these features that must be documented. For maintenance and repair purposes, locations of these features must be accurately recorded and mapped in the SandRidge enterprise GIS. In the event of a leak, for example, a specific valve must be found quickly by field personnel to shut off the segment of the pipeline where the rupture occurred. Buried pipe branches must also be easily located by pipe installation crews so new lines can be inexpensively connected to existing ones. Cutting into a pipeline where no branch fitting exists can cost from $10,000 to $15,000. Prior to implementation of the smartphone data collection app, SandRidge inspectors identified each critical feature with handwritten notes as each section of pipe was buried. The inspector snapped a photo with a digital camera and then captured location coordinates with a handheld GPS receiver. The coordinates and photo number were entered by hand onto note papers. Later in the day, the inspector went to the nearest SandRidge field office and keyed the data into a prepared spreadsheet template on a desktop computer and downloaded the digital photos from their cameras. A few inspectors had laptop computers and transferred the written data to them at some point during the day, but they still returned to the office to complete the filing process. 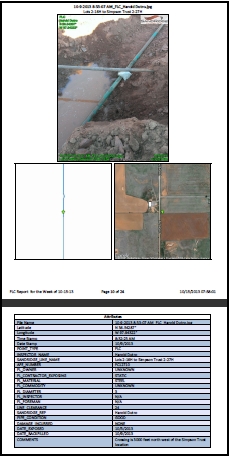 Once the field data was entered onto the correct digital form, the inspector attached the corresponding photo and emailed the information to the Oklahoma City headquarters. The need for inspectors to travel to SandRidge offices and manually file their reports was a major source of frustration for everyone involved because it removed them from the pipeline construction site for several hours each week. This meant that during that time, they were not performing their primary task, which was to monitor the safety of the installations. 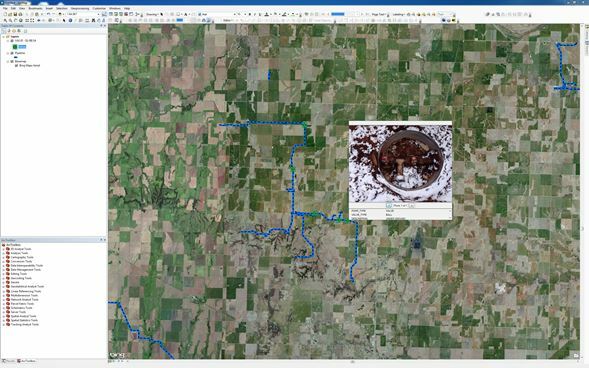 Maintained by the corporate IT Department in Oklahoma City, the SandRidge GIS was built with Esri ArcGIS software and uses ArcSDE to make the map-based system accessible to the entire enterprise, including remote field offices. The GIS contains multiple layers depicting the company’s 1.85 million acres of leases, along with production wells, electric network and various pipelines. The saltwater disposal system is represented in one of those GIS data layers. To update the database with new saltwater pipeline information prior to implementation of the smartphone technology, a GIS analyst in the home office downloaded the filed reports – about 30 per week – from their email every few days, checked them for accuracy and manually entered the location coordinates for various pipe features into the GIS. The analyst also manually attached the digital photos as attributes to the features in the Geodatabase, which holds the information in the GIS. From field to office, the manual data collection and entry method induced many errors. By far the most common was the incorrect entry of GPS location coordinates by an inspector, either because he misread the GPS screen or wrote down the wrong latitude/longitude digits. Fortunately, this was often caught by the GIS analyst who realized the location could not be accurate when it was posted on the GIS basemap and didn’t correspond with existing asset placements. The other common mistake was a photo attached to the wrong report when emailed to headquarters. In both cases, assuming the mistake was noticed, the analyst had to send the inspector back to the site to make the corrections. This occurred several times per week, taking the inspectors even further away from their primary tasks. In mid-2013, the SandRidge GIS office found a potential solution that could both streamline the field information collection process and significantly reduce errors. The solution was GeoJot+, a product developed by GeoSpatial Experts of Thornton, Colo., to convert camera-equipped, GPS-enabled smartphones or tablets into mobile data collection device. The package appealed to SandRidge because it was sophisticated enough for serious GIS work, but easy to train an independent contractor. their pipeline inspectors, such as the one above for Foreign Line Crossings, to ensure accurate and consistent data across inspectors. The GeoJot+ package is composed of the app, main software and web dashboard. The Android or iOS application operates on the smartphone and is used for data collection. The Core software runs on a computer in the office to process the collected data later for output as printed reports or GIS-ready data layers. And a web-based administrative dashboard enables the GIS analyst to activate and de-activate the mobile apps as the contract inspectors join or leave the payroll. SandRidge inspectors are expected to use their own smartphones. In preparation for field use, the GIS analyst used the GeoJot+ Core software to create custom drop-down data collection forms that would be used by every inspector, ensuring information consistency throughout. Because the data gathering process was expected to be faster and easier with the new technology, the GIS office decided to have the inspectors input a greater number of feature attributes and descriptions than previously required for the critical pipe features. A specific form was created for each of the four pipeline features. As drilling and completion rates vary with oil prices, SandRidge brings on new inspectors as needed and they are often on short-term contracts. This means that training personnel in the use of the mobile app is a continuous process. A GIS analyst typically walks a new inspector through the app during a 45-minute phone call. Most catch on immediately and few require a follow-up tutorial because so much of the process is automated. Replacing a notebook, GPS receiver and camera with the smartphone the inspectors already carry has been extremely well received because it reduces the number of devices they have to bring into the field. As they encounter a pipe joint, valve, branch or line crossing in the field, the inspector simply launches the app from their Apple or Android phone. The first menu prompt is for the inspector to identify which of the four pipeline features he is about to map. The app then directs him to snap the photo. Next, the inspector enters feature-specific data from a list in a drop-down form. Valves, for example, must be further described by their SandRidge line name, diameter, AFE number, type, and above- or below-ground placement. Foreign line crossings are slightly more complicated because the inspector must also describe the third-party’s asset. While nearly all of the data entry is done by clicking on the drop-down menu, the inspector is offered a comment box where any additional information – such as notes on line damage – can be entered using the smartphone keypad. The entire data entry process takes about three minutes, compared to 20 minutes with the manual method. Once data entry is completed, the inspector presses ‘Done’ to close the file. If a wireless connection is available, the app instantly uploads the file along with the photo to a cloud archive. SandRidge uses a third-party cloud archiving service. In the many cases when a good wireless connection is not found out in the field, the app holds onto the file and uploads it automatically when WiFi or cell coverage is later encountered. Except for a weekly staff meeting, inspectors now have no need to leave the field and visit a SandRidge field office, saving time and mileage. This keeps them onsite at the pipeline installation an additional three to five hours per week. As soon as the file is uploaded to the cloud, the GIS analyst at the Oklahoma City headquarters can access it. The analyst downloads the file into GeoJot+ Core package and opens it in an editing screen. Because data transfer and transcription errors have been almost entirely eliminated, the analyst visually examines the data just to ensure the photo is sharp and the location accuracy is acceptable. For most smartphones, the internal GPS chips are capable of 3-5 meter accuracy, however, the visibility of GPS satellites can have an impact. If the accuracy is outside of 30 meters, the analyst asks the inspector to return and capture new coordinates, but this is a rare occurrence. After reviewing the data, the analyst outputs the files in digital and hardcopy form. First, the software converts each feature and its attributes, including photo, into a Geodatabase format for loading into the enterprise SandRidge GIS, where the features can be queried and accessed by anyone in the company. Locations of the saltwater pipeline features are viewed as icons on the GIS basemap. In addition, the GIS office uses GeoJot+ Core to generate weekly reports summarizing the pipeline installation progress for that period. Each individual feature file is presented in PDF format with an attribute table and photograph. The software also produces KMZ and HTML files that can be emailed to managers involved in the saltwater pipeline work. These pinpoint the locations of all newly installed features on a satellite image map that anyone can open and view on their computer without accessing the full GIS. Generating Weekly Reports A page from the weekly report that the GIS office generates to summarize pipeline installation progress using GeoJot+ Core. Prior to implementation of the data collection application, the GIS analyst spent approximately eight to 12 hours per week editing files, transcribing data and creating the reports. Today, this work is completed in two-and-half hours. SandRidge is considering expanding the mobile application to other field work. It has significantly reduced data collection errors, saved time for field and office personnel, and the entire company has greater confidence in the saltwater pipeline information contained in the enterprise GIS. Noxbox ICO: NBX Tokens For Blockchain Services Mobile App?